Plum Liquor is a very popular recipe. 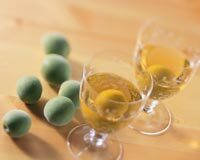 Learn how to make/prepare Plum Umeshu by following this easy recipe. Wash and quarter the plums. Fill them in a mason jar. Add 3 cups of dark rum and 4 cups of sugar. Turn the jar once every day for 15 days to allow the sugar to dissolve. Filter out the fruit bits after 16 days.